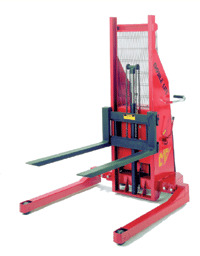 The Mobile Hydraulic Stacker ML-B60CSA is designed to handle all types of applications such as lifting and transporting skids, bales, baskets, etc. 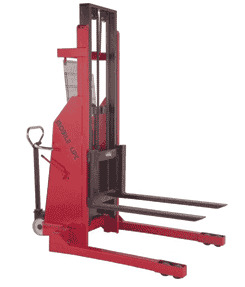 ; loading and unloading trucks; stocking shelves; die and mold handling; and can handle all sizes of pallets due to the adjustable legs. Raised Height 60" to 144"
Straddle Legs 34" - 50" I.D. Adjustable 42" fork O.D. 8" - 24"